Our household is an active one, and since we live in earthquake-prone California, we like to keep our emergency supplies stocked. So we have plenty of battery-powered lanterns, headlamps, and flashlights, which we use in case of power outages and for camping. Flashlights are great for direct beams (checking outside the tent for bears in the middle of the night) and lanterns provide helpful general light in a cabin or tent or when we're building a fire or setting up camp. We use headlamps for nighttime reading and trips to the restroom. What I have been missing is a light that functions as a reading light, "overhead" light for a tent, emergency beacon, and a cell phone charger. I didn't know such a device existed, but it does and now I have one. It's called a LightStick. It looks kind of like an off-duty lightsaber or a long and narrow pneumatic tube. At only 1/2 pound, it offers four different light settings: three levels of brightness (350 lumens on the brightest setting) and one emergency flash. One end has a button to turn on the light and the other end is equipped with a USB port to charge your phone and a micro-USB port to charge the 5200mAh battery. Four small blue LEDs indicate the battery strength. 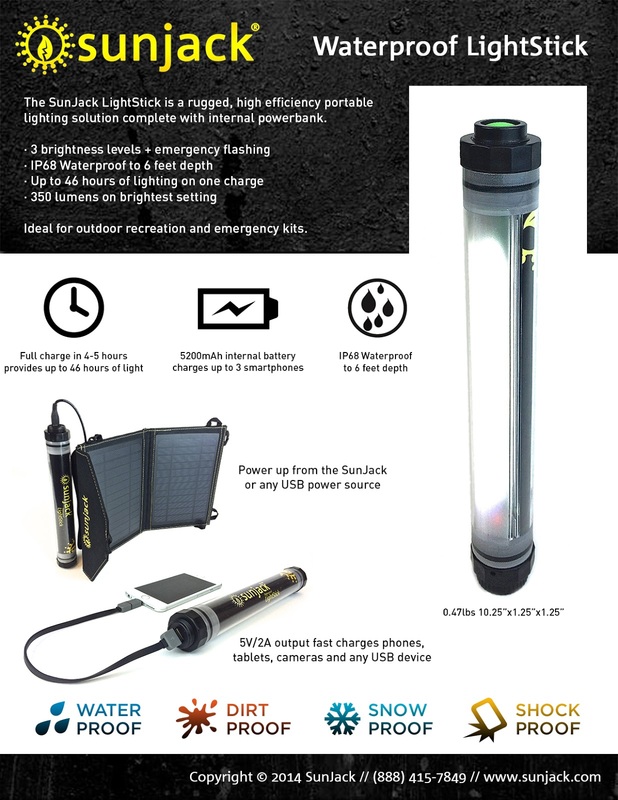 If you spend time hiking, the LightStick is a great addition to your backpack. In case of emergency, you'd be able to signal rescuers, guide yourself in the dark, and charge your phone. And it's rechargeable, so you don't have to worry about having bulky batteries on hand. On a recent mountain trip, I used the LightStick to read and found it an improvement to my headlamp. The quality of the light and broad coverage area are wonderful. The two lanyard-like loops on the ends of the LightStick can be clipped to a carabiner to hang the light horizontally (super useful in a tent). The good people at sunjack sent me a free LightStick in exchange for an honest review.